Since 1934, ESYO has provided a place for young musicians to LEARN, GROW, LEAD and PLAY! CLICK HERE for a SLIDESHOW of our anniversary event! The final concerts of this special season are coming up! May 21, 22, and 23 – CLICK HERE for details and tickets! Our vision is to inspire and lead students on a journey of discovery through orchestral instruction and performance. We offer the highest-quality instruction, progressing from beginning classes to advanced orchestras. We provide need-based scholarships for fees and private lessons, and collaborate with area schools and arts organizations. ESYO continues to enrich and encourage young musicians, helping to grow the culture of music education in our community. 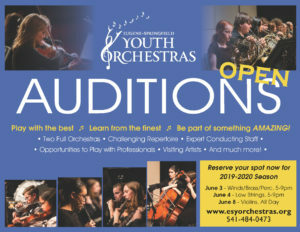 BE PART of the YOUTH ORCHESTRAS! This is your chance to join one of these amazing ensembles! CLICK HERE to read more about it, and sign up for an audition. Whether you’ve played for one, two, or ten years, we have a place for you. String Academies offer classes and smaller ensembles to get started. Auditions are required for our top three orchestras: Little Symphony, Junior Orchestra, and the Eugene-Springfield Youth Symphony. The benefits truly can last a lifetime! ESYO musicians presented two wonderful evenings of music, enjoyed by over 500 audience members. What a fabulous start to this special season! Calling All Alums! Tell Us Your Story!